Are you called to a specific place? Does one area of the world draw you in? I’m definitely being pulled back. They call it “The Land of Enchantment” for a reason. How and why do specific spaces do this? One area of the world may attract a person while repelling another. So what is innate within each of us that connects us to an area? A place develops its own story and personality through the histories, layers, and people before and after us. 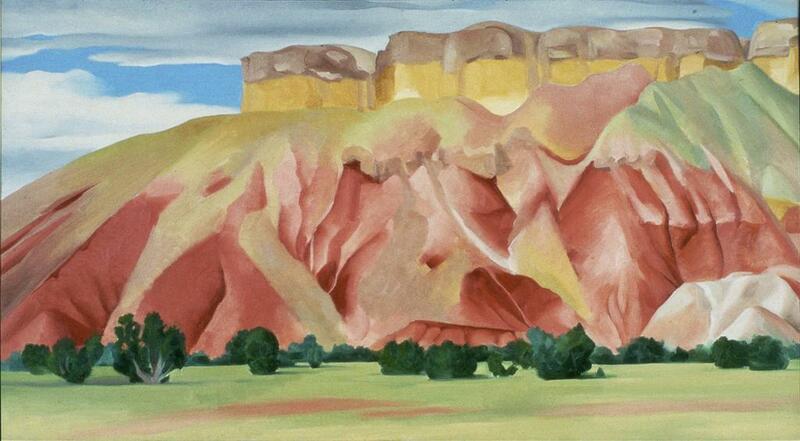 One famous story embedded into the New Mexico landscape that we love to talk about at the Georgia O’Keeffe Museum is, of course, the story of Georgia O’Keeffe. She fills in both of the criteria to make a place a place: she is one woman who added to the long list of the land’s histories and legends, and one who paid careful, caring attention to the land to poetically show it to us today. 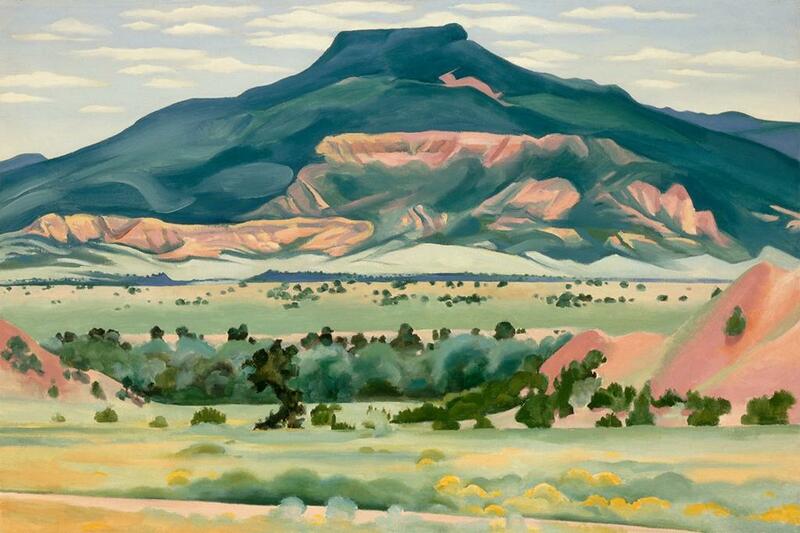 This artist truly identified with New Mexico and was continually drawn back each summer from 1929 until she moved permanently in 1949. 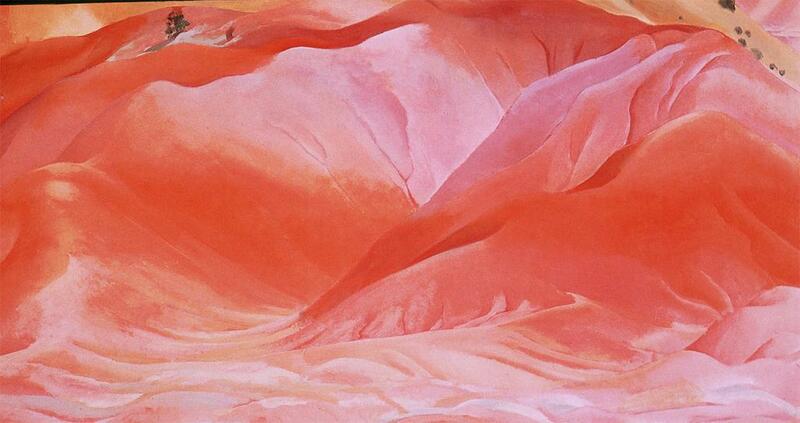 She also said, “I have this mountain,” referring to the Cerro Pedernal. 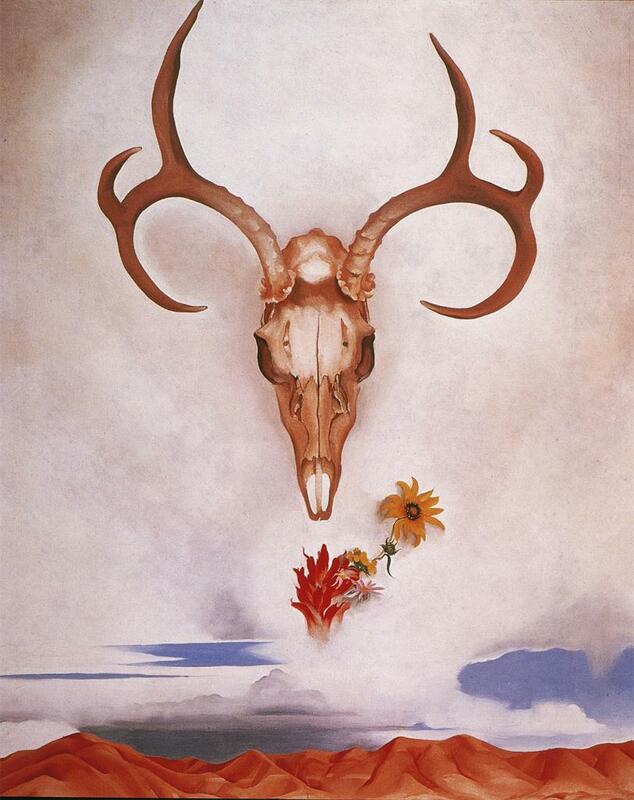 Now, the land is often referred to as “O’Keeffe Country”. Some might say this is a bit possessive of a natural space, but don’t many of us do this when we are drawn to a place? We begin to identify with the land. Though it is true that Miss O’Keeffe undeniably added much of the personality and history to making this place a place, we cannot forget the thousands of stories many others have added over time. It is all of these stories combined that layer to give this place a feeling and an essence. These layers are much like the layers of rock, each a different color, each a different line, each a different tale. Perhaps this personal reflection and contemplation arises because there is a vast area of space to think. The landscape is not cluttered by buildings, nor is it overwhelmed by the noise of traffic or people. Rather, it is completely still. The silence allows a visitor to hear and truly feel the wind. It is quickly apparent that this emptiness is why the word “desert” comes from the Latin word for “abandoned”. However, when we are out in the New Mexico summer heat with the peachy-tan swirls of desert dust circling around our ankles, the space seems to be anything but abandoned. True, it is not the full-on isolated space of a distant desert, but it still has the heat, stark wildness, and empty space characteristic of these landscapes. But life is all around! There are the little bugs waddling through our footprints carrying a cargo of leaves or twigs to their next destination. There are the white, fluffy clouds floating over us, moving with the enlivening breeze. 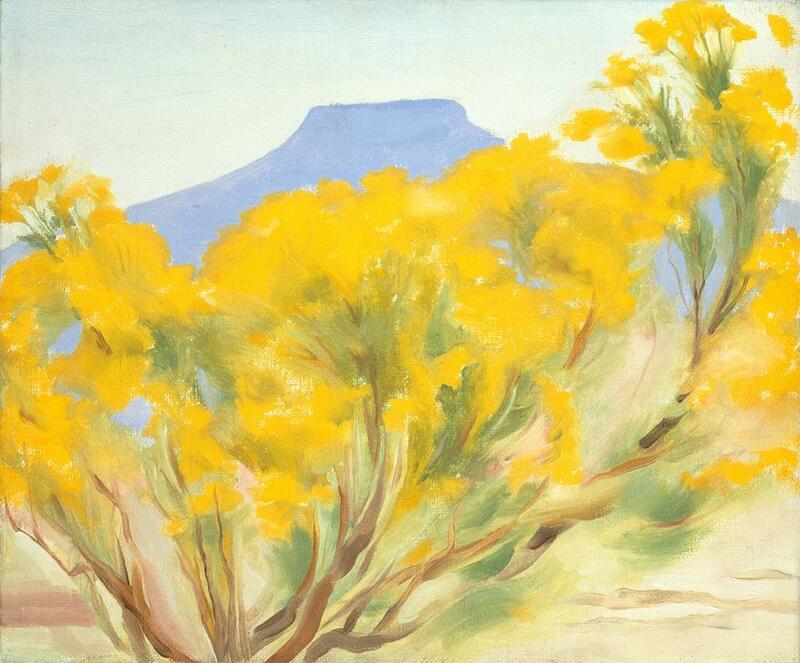 And this summer, there are the infinite fields of yellow flowers and green shrubbery adorning the mountain slopes and flat lands. But trying to put words to a space as magical as this does not come close to capturing the entirety of the feeling that saturates the area. (quoted in Poling-Kempes, Ghost Ranch 7). Though many people have feelings of spiritual connection to this space and other landscapes, there are a vast array of connections we can feel to an area. There are connections of healing, nurture, excitement, joy, adventure, peace. Whichever it is, these are strong connections that speak to us and pull us closer. Yes, it is the histories. Yes, it is the human attention. But I also believe a place becomes a place when it makes us feel completely present and alive, at least for a moment, forgetting the past, forgetting the future, and just being. When we are in these spaces where we feel connected, we can be right here, appreciating the ground beneath our feet, the wind in our hair, and the infinitely blue, blue sky above us. Though my internship is drawing to a close much too quickly, I have a feeling that, like Miss O’Keeffe, I will always be on my way back. Poling-Kempes, Lesley. Ghost Ranch. Tucson: The University of Arizona Press, 2005. Print.